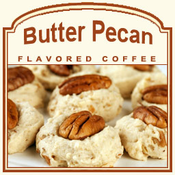 Butter Pecan is a truly developed flavored coffee with a rich, full-bodied flavor of roasted pecans swirled into a warm, melted, and creamy buttery flavor. If you love southern pecans and a melt-in-your-mouth palatable smoothness, this Butter Pecan flavored coffee will satisfy your taste buds. Delicious in taste and aromatic with its sweet buttery smell, this Butter Pecan coffee will hit the spot with its wholesome flavor that tastes perfect in the morning and in the evening. With only 2 calories, you can indulge whenever you like. Packaged in a heat-sealed valve bag, we ensure the freshest coffee will be sent to you � this is why we roast and ship on the same day! Go ahead, savor the buttery pecan undertones. Your taste buds will thank you for the mid-day treat!